He Holds My Right Hand: What Are You Thinking About? 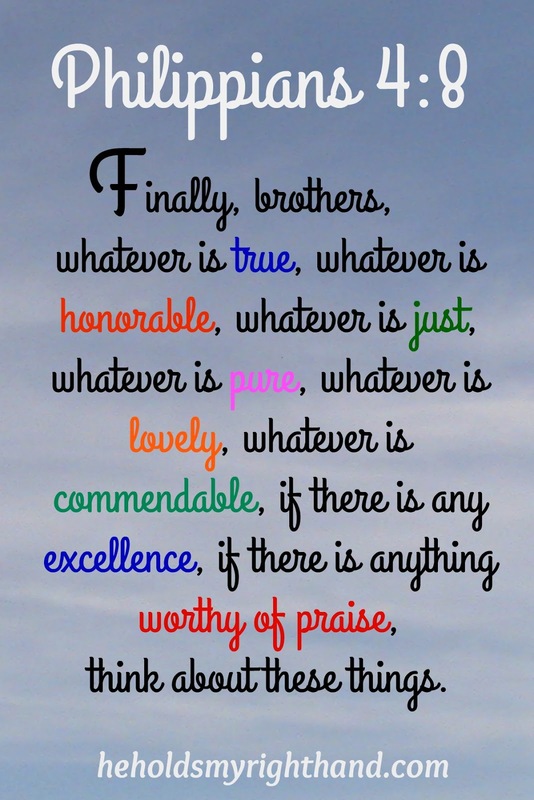 I have been reading in Philippians lately was reminded to take notice of the things I am thinking about. What kinds of thoughts am I dwelling on? Some of these thoughts bring peace. Other thoughts bring discontent. I want to try and dwell on the thoughts that only bring peace. If YES - then keep on thinking about it. Dwell on these good thoughts and be at peace. If NO - then do not dwell on these thoughts. They will only bring discontent. 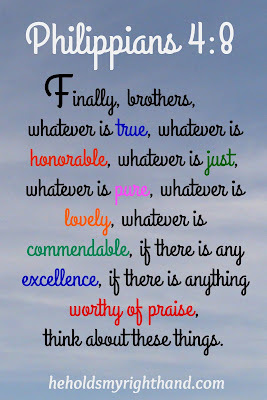 NOTE: The definitions for the words above came from the Text Analysis of Philippians 4:8, found on BIBLE HUB.